As the world is largely dominated by fossil fuels, search for various unlimited and green sources of energy is necessary to replace depleting energy sources. Wave energy is one of the classic examples of such green energy. 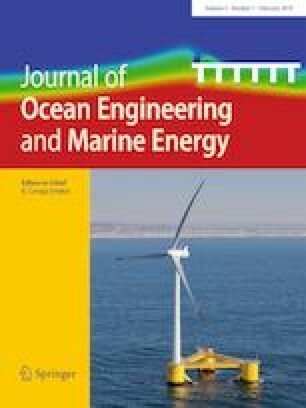 The present study discusses design and development a new floating wave energy converter (FWEC) under the waves of different approach angles. Proposed device consists of the central buoy to which tubular floats that extract wave energy are connected circumferentially. It makes both the functionality and form of the device different from other existing FWECs. The proposed device is developed to operate in near-shore conditions of India, where it is examined under irregular waves of multiple directions individually. Dynamic parameters of the device are closely examined to assess its performance for all the wave sets considered in the analysis. A preliminary experimental investigation done on this model is thus compared to a numerical model for a set of wave conditions to ensure its application in reality. Mechanical power obtained from the float shows the efficiency of about 25% in a few critical cases.